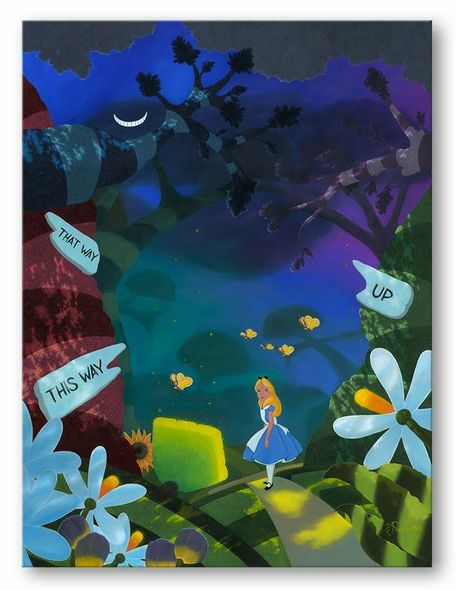 Home | Disney and Animation Art | Disney New Arrivials | Michael Provenza Hand Signed and Numbered Limited Edition Embellished Canvas Giclee:"Curiouser" OFFICIAL | Gallery Direct Art | 800-733-1144 Free Ship. No Tax. Michael Provenza Hand Signed and Numbered Limited Edition Embellished Canvas Giclee:"Curiouser"
Edition: Artist Signed and Numbered Limited Edition to 195 with COA. About The Artist: Michael Provenza has a totally original perception of nature and landscape. Provenza's oil paintings reveal a successful blend of the old with the new - merging a realistic and remarkable dimensional quality with a surreal and magical environment - in a truly distinctive style characterized as Surrealist Pointillism. "Viewers of my work say they feel as if they can walk right into my paintings - they want to be there." Born and raised in the San Francisco Bay area, Provenza has lived, worked, studied, taught, and painted for more than 30 years. Inspired by his artist grandfather, Provenza began painting at age nine, pursued art academically holding a Fine Art college degree and continues to professionally create oil paintings as his life-long passion. Provenza has become a highly recognized and collectible artist both nationally and internationally. "My paintings are an exploration or journey that I'd like to take in a world that comes from my imagination with pieces of reality sprinkled in." All of Provenza's work invites you in to experience Life's Journey - with a twist. Home | New Releases | Michael Provenza Hand Signed and Numbered Limited Edition Embellished Canvas Giclee:"Curiouser" OFFICIAL | Gallery Direct Art | 800-733-1144 Free Ship. No Tax. Home | Fine Art Prints & Limited Editions | Collectors Editions | Disney Fine Art | Michael Provenza | Michael Provenza Hand Signed and Numbered Limited Edition Embellished Canvas Giclee:"Curiouser" OFFICIAL | Gallery Direct Art | 800-733-1144 Free Ship. No Tax. Home | Disney and Animation Art | Disney Fine Art | Michael Provenza | Michael Provenza Hand Signed and Numbered Limited Edition Embellished Canvas Giclee:"Curiouser" OFFICIAL | Gallery Direct Art | 800-733-1144 Free Ship. No Tax.